Want to add a fascinating finish to the walls of your home and stay on-trend with the latest interior designs? Real Painters in Greenwich can help you achieve this without efforts and concerns by providing you with a high quality wallpapering service. Our courteous and hard-working technicians will deliver a truly professional wallpapering job that will meet your requirements the first time. 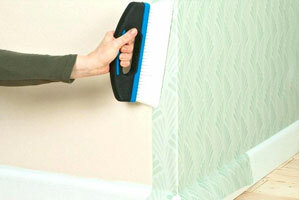 Before decorating your premises, our technicians will prepare the walls by removing any existing wallpaper or woodchip. They will also eliminate any small pieces and residue left in order to guarantee that the wall is smooth and ready for decorating. After measuring and cutting the chosen wallpaper to the correct lengths, our professionals will apply adhesive to the surfaces. Then, they will hang the lengths to ensure a straight and smooth finish, on walls and around corners and stairwells. To book a an accurate and efficient wallpaper hanging service with us in Greenwich, simply dial 020 3026 9530, complete our online contact form or use the live chat support feature on our website.